A patient who stole an ambulance from outside a hospital in Co Louth and crashed it head on into a school bus has been jailed for a total of two and a half years. Dundalk Circuit Court heard the bus driver had just dropped 20 children back to school and he was heading to his base when the ambulance crashed into him on 16 May 2014. Cathal Doolin, 50, with an address at Glenmore Drive, Drogheda, was already a patient at Our Lady of Lourdes Hospital in Drogheda for two days when, Mr Kevin Segrave prosecuting said: "he viewed he ought to leave the hospital quickly." He pleaded guilty to causing criminal damage to the ambulance, school bus and a security barrier, as well as dangerous driving and having no insurance. The ambulance had just brought a patient into the emergency department of the hospital and Doolin had got into the front seat and locked the doors. 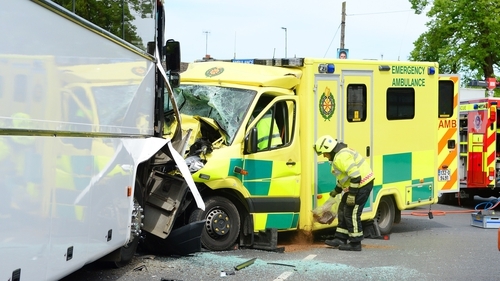 The ambulance collided with the security barrier before heading onto the public road. On the Ballymakenny Road, it collided with the 53 seater Volvo coach which had just dropped 20 children to their school. Garda Inspector Declan Power said the ambulance, "crossed a continuous white central line and collided practically head on with the coach." Both vehicles were beyond repair. Doolin told gardaí he had felt compelled to leave the hospital. He had been brought there by ambulance two days earlier with chest pains. Doolin was severely alcohol dependent and at the time was having hallucinations and was in a psychotic episode that can develop after being without alcohol for 24 hours. Judge Michael O'Shea heard Doolin was extremely remorseful and embarrassed and regretted what he did. A handwritten letter of apology from Doolin was handed to the court. Judge O'Shea said his behaviour was "extraordinary and bizarre," and Doolin had no concern for the safety of others. He imposed three and a half year jail terms for the damage to the ambulance and bus, with the last 12 months suspended, and two years for damage to the hospital security barrier. He was jailed for four months for dangerous driving and for having no insurance. All are to run concurrently and date from last October. He also disqualified Doolin from driving for four years.